'Gold & Grey' trek kicks off July 11. Progressive hard rockers Baroness are readying their fourth album, Purple, for a December 18 release via their recently formed label, Abraxan Hymns. Baroness Premiere Live Music Video for "March To The Sea"
Baroness Involved in "Serious" Bus Crash in U.K.
BBC is reporting that Savannah, Georgia's Baroness have been involved in a serious bus crash, which saw their tour bus fall 30ft from a viaduct. It's never fun going first, but Baroness took full advantage of their opening slot at this past weekend's Orion Music Festival + More. 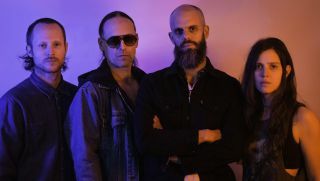 Baroness Streaming Another New Song, "March to the Sea"
Earlier this week, Baroness premiered another new song off their upcoming double album, Yellow & Green. Stream "March to the Sea" below. Baroness Streaming New Song, "Take My Bones Away"
Savannah, Georgia-based metal band Baroness have just posted a teaser for their upcoming double album, Yellow & Green, which features 41 seconds of new music. Watch it below. If you're wondering why it's taken so long for a new Baroness record to surface, this may answer your question. Savannah, Georgia-based metal quartet Baroness have announced a summer release for their new album, Yellow & Green. Another long-rumored tour for 2012 has been confirmed, as Meshuggah will be hitting the road with Baroness and Decapitated starting in late April.